We are going through some exciting changes at the U.S. Army Heritage and Education Center to make our collections more available online...Beginning in October 2018, the USAHEC will be undertaking a large-scale digitization project including many of our manuscripts, photographs, audio-visual, artifact, and other collections. There will be times that collections are not available due to the digitization process. We also have a new search interface that will integrate the collections of the U.S. Army Heritage and Education Center into one search: books, manuscripts, audio-visual materials, art, weapons, uniforms, and more! Please note that during our time of transition, the search system may not show all collections available to researchers. Please contact our Reference Desk, 717-245-3949, for assistance. We ask for your patience as we strive to meet the needs of all of our patrons. 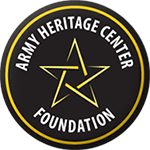 The Army Heritage Center Foundation, in cooperation with the U.S. Army and our other partners, serves as the lead agency supporting the development and expansion of the U.S. Army Heritage and Education Center (USAHEC).